Recently I played around Data Aging concept in S/4HANA system and today I would like to show you how to perform the initial configuration based on SFLIGHT data. This sample data model delivered by SAP allows us to understand the process of data aging without having to worry how to create sample business documents as data generation is simple and straightforward. Having system running for months or years we need to properly maintain it. We need to ensure the system is available during business hours and performance is on required level. System is growing together with your company and at one moment you have to decide what to do with data that is no longer used. So far the best solution was data archiving, which allows us to store data on separate storage outside SAP system. Data aging is new possibility to manage outdated information and helps to move sets of data within a database by specifying a data temperature. Hot data resides in current area of the database, when the warm / cold data is moved to historical area. You can either generate the data using SAPBC_DATA_GENERATOR and copy content of the tables or copy the whole report and change the target tables directly in the source code (I used the second approach). The second preparation step is to activate Business Function DAAG_DATA_AGING in SFW5. Currently there is no partitions defined in our system for SFLIGHT. There are two ways of creating partitions. We can do it manually or use additional tool delivered by SAP – Partition Proposal. To enter Partition Proposal, click on desired Partition Object and choose “Propose Partition Ranges” from menu (or click F9). Depending on partitioning object setting value in Date Field may be already filled. In our case let’s choose FLDATE as the date field for DAAG_SFLIGHT and DAAG_SBOOK. After execution, we can see Proposed Partition Ranges and Data Volume in each year / month. In Proposed Partition Ranges we can easily simulate creation of new partitions and the tool will update us with information about projected data volume. This time we will create partitions manually. Go back to Manage Partitions and click on Period button. After confirmation of the dialog box we can run partitioning. Background job ran only for few second to create partitions. You can see there is one partition created without Start and End date defined. This partition stores current (hot) data, others are for the historical area. When we expand partitioning object and select table we can click on the ‘eye’ button to check how many data is in current and historical areas. As we didn’t execute aging, all data resides in current area. We can see our table is partitioned on database level according to our requirements defined in previous steps. At the moment there is no records in any other partition than the current one – which is good. We can also check if the partition is loaded to memory (last column). Now we need also to decide what shall be the residence time for our documents. We can set thevalue in table DAAG_RT_SFLIGHT. It’s quite flexible – we can set different values based on Carrier and/or Flight Connection. For our testing scenario I want all objects older than one day to be moved to historical area. To display all data aging objects, go to transaction DAGOBJ. When we double click on the object name we can see details like participating tables or implementation class (which actually drives the data aging run by selecting objects to be moved to another partition). To activate the object, on previous screen select DAAG_SFLIGHT and click Activate button from the menu. During activation system is running various checks, like data object consistency or existence on partitions at database level. Once our partitions are created and data aging object is activated we can execute the actual Data Aging. In order to do that enter transaction DAGRUN. If you are not able to save your entries and there is error message displayed saying “DAAG_SFLIGHT is not an application data aging object” there is one correction needed. Please update table DAAG_OBJECTS by setting DAAG_OBJ_TYPE = “A” for data object DAAG_SFLIGHT. Finally, we finished preparation steps and we can schedule Data Aging run. After confirming the dialog box the job will start at chosen date / time. And when it’s done we will find a green light in status column. Let’s see what happened to our data. Go to Manage Partition to display Hot and Cold Data for Partitions of Table DAAG_SBOOK. Success! Our data is now aged! Based on blog I was able to write a small report to count rows by setting data temperature. This is awesome concept with practical views testing scenario. Data aging is MUST for all organisation. I tested in our S/4HANA it works like a charm. In details – The data aging object for accounting documents (FI_DOCUMENT) replaces the archiving object FI_DOCUMNT, which makes standard archiving for financial documents no longer possible. Message FG025 (“Archiving is obsolete for the FI document; use aging”) is displayed when triggering the archiving program without the SAP Information Lifecycle Management (ILM) business function activated (see SAP Help for SAP ILM). FI_DOCUMENT is an application aging object, which means that it is delivered by the SAP application (SAP S/4HANA Finance) and that it has a runtime class that implements the IF_DAAG_RUNTIME interface. thank you for this great step-by-step guide on how to activate data aging. Before I come to my question I have two suggestions: Perhaps you could replace the screenshot of your test report with the actual code and name the profile parameter abap/data_aging also in the text so it can be indexed by the search engines (solved that by this comment ;-)). Seems that data aging is a topic SAP is still improving a lot. I.e. the functionality to Propose Partition Ranges was not available in NetWeaver 7.50 SP0. According to my search result at help.sap.com it was introduced in SP3. In the slide you’ve posted at the beginning there is a mentioning of SAP Note 1872170 – Business Suite on HANA and S/4HANA sizing report with the text “Footprint reduction potential”. Have you tried this report and where you able to identify the potential? Have you gained operational experience with data aging that you are able to share? 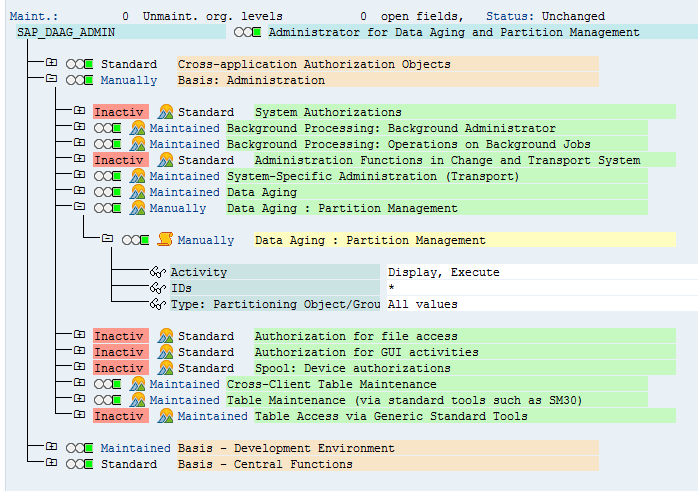 As data aging is using SAP HANA Table Partitioning I would think the documentation Designing Partitions is highly applicable. Have you taken it into consideration? I did some investigation around this topic for several customers, but so far everything is the planning phase. As for now I think the standard Data Archiving is more applicable for most of the customers, but it might change soon. This report is excellent to plan migration to HANA, but it didn’t really helped me with Data Aging. Even now I run it to check the outcome, but it only says the data aging is activated for table ACDOCA. Currently the data aging in Netweaver is working based on document dates. It means you don’t have to get into such details. Also I’m trying not to give too much information in the form of copy / paste to encourage others to learn. I believe if you have to re-type some code it will stay in your head for longer (and very often it’s just easier to understand). But thanks for raising it, I will try to include more data in the text to be search engine friendly! thank you for that informative blog. Gregor just mentioned also 2 of my questions already, so I just add one below. I wonder a little longer how to identify the data aging tables easily, do you or someone else have a hint for me? I’m not sure if I understood your question correctly, but If you go to DAGPTM then you can find list of tables for each of the partitioning object. seems SAP is developing quite a bit in the data aging area. The functionality described by Bartosz regarding Proposed Partition Ranges was not available in the system that I’ve tried. 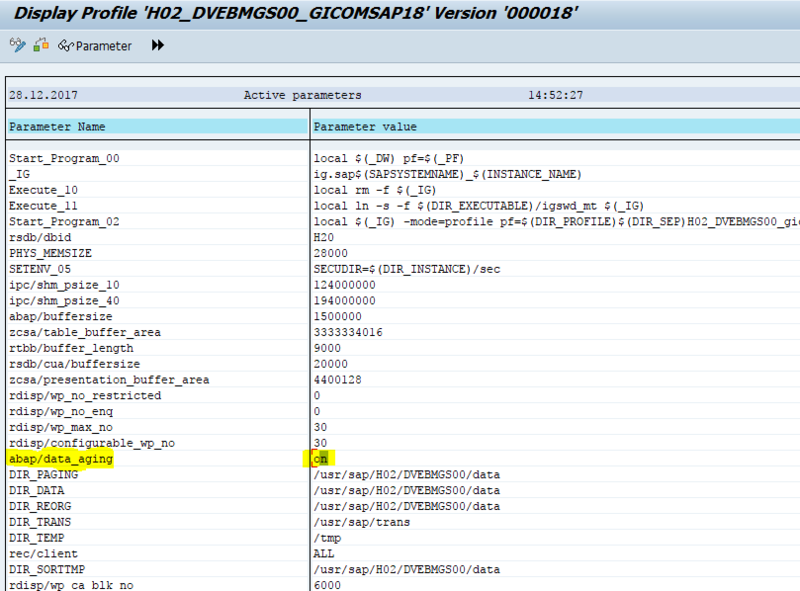 But you still will see which standard Objects SAP enabled. And I think they created them for a reason. You can use Transaction TAANA to identify how the data distributes by date. thank you for sharing this. While adapting it I asked myself, is there some sort of functionality to merge partitions or even ‘repartition’ them within SAP GUI to the original version where there was no split with time selection? I am asking because I’m using an older version where I don’t have the proposed partition ranges e.g. and I think there is more to come like Gregor said. at the time I was writing the blog I couldn’t find any functionality to re-partition the table or delete the partition. I used SE14 to delete the database object and create it again. Obviously this is something I wouldn’t recommend on any other system than sandbox. What is the reason this option is invisible for me? unfortunately there might be many reasons why you can’t perform this activity? Do you have necessary authorizations? Is the button completely gone or you just can’t click on it? It would be helpful if you post a screenshot. Look. Besides I have this two roles asigned. Details of authorizations of DAAG_ADMIN role. My Sap Basis component is 740 SP level 0013 and SAP sfinancials 1503. I have find out the error. It’s something with the session, I just only exited of the transaction and tried again and I was able to complete the action. Very helpful blog. I have two question though. 1. From data volume management perspective data ageing helps us to reduce hot data foot print but Information life cycle management perspective how data ageing can help us with destroying data that’s past its retention period. 2. Does SAP ILM has a role in S/4 HANA ? For data retention, you should use Data Archiving instead. You can use ILM for that. For application like simple finance, In S/4 HANA the only option I believe is data ageing and I cannot continue using data archiving on this application in S/4 HANA. So we cannot enforce retention policy for simple finance in S/4 HANA (Since it does not have data archiving / ILM in S/4)? For practical purposes is there any limit to the data which can be “aged”? 4TB(in-memory) & 16TB(on-disk) should be okay? Based on our understanding the limitation in memory is defined by the HANA product. To my knowledge the biggest HANA database is a scale out of 48TB in memory. The size on the disk is limited by max size of the HANA database. 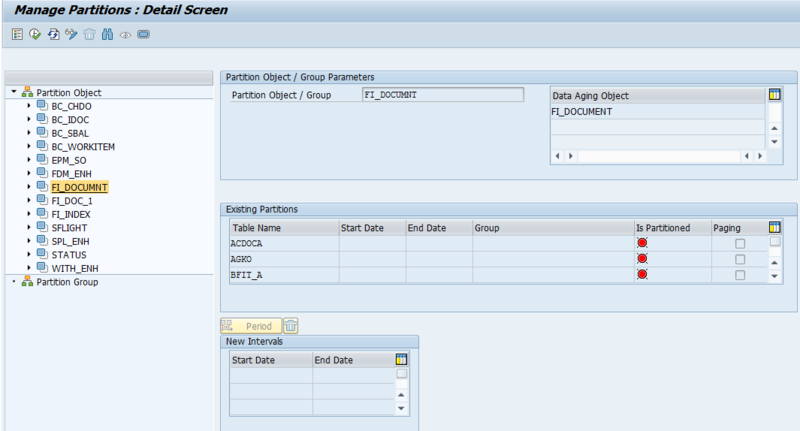 To my understanding the limitation is the amount of partition a single table in HANA is allowed to have + the amount of the entry in a partition. Great blog .Very informative and useful. Thank you so much for the detailed explanation on Data Aging concept. I am following the steps you mentioned, but I encountered a problem(error) while activating the Data Aging Business Function in SFW5 transaction. Error – “DAAG_DATA_AGING cannot be activated as profile parameter abap/data_aging is not selected”. I maintained the data aging profile parameter value as: “on”. (though I don’t know exactly what value I have to assign it). May be this is the reason for the error, but I am not sure. Can you please help me in resolving this error. Did you restart your application after changing the profile parameter? I didn’t understand what does “restart application” means here. Can you please give me steps on how to restart application. Sorry for confusion. I meant application server (your SAP system). after changing profile parameter it is required to restart application server that new settings are applied. when I am taking the action of propose partition ranges for partition object with data filed fldate. I got an information with :The row count of the selected tables is less than threshold 300.000.000, when I click continue but no data updated on the screen? 2. when I run partition jobs after configured the periods some errors in job log and the partition was failed. what is the first level hash partition? I’m sorry, but I have no encounter issues like you and to be honest I’m not sure how to solve it. I would check that you have big enough sample of data and that the table is not partitioned before running the job (at HANA level). If that doesn’t help please raise a question on the Q&A section of SAP Community. However, towards the end of your blog the screenshot from HANA studio with all partitions (hot and cold), the last column “Loaded” still says “FULL”. Does that mean that in your example, your historical data also residing in HANA memory ? That should not be the goal, no ? Also, what happens to data in ‘historical partitions’ ? Can you still edit them ? When you query a data, only the partition containing the data is loaded to memory. You’re correct, maybe the screenshot is not the best – I was probably playing around running different select statements and entire table got loaded. I’m not aware about any problems with editing the partitioned data, however it may also depends on how the report was written. we are looking to implement the hana data aging in our landscape. Regarding this I have below two queries which i could not fine the answear anywhere. It will be great help if you can help me with the answear to these two queries.